Top SAC Capital Manager Guilty Of Insider Trading : The Two-Way Michael Steinberg, the highest-ranking employee at the hedge fund to be convicted in an insider trading sweep, was found guilty on five counts of conspiracy and securities fraud. 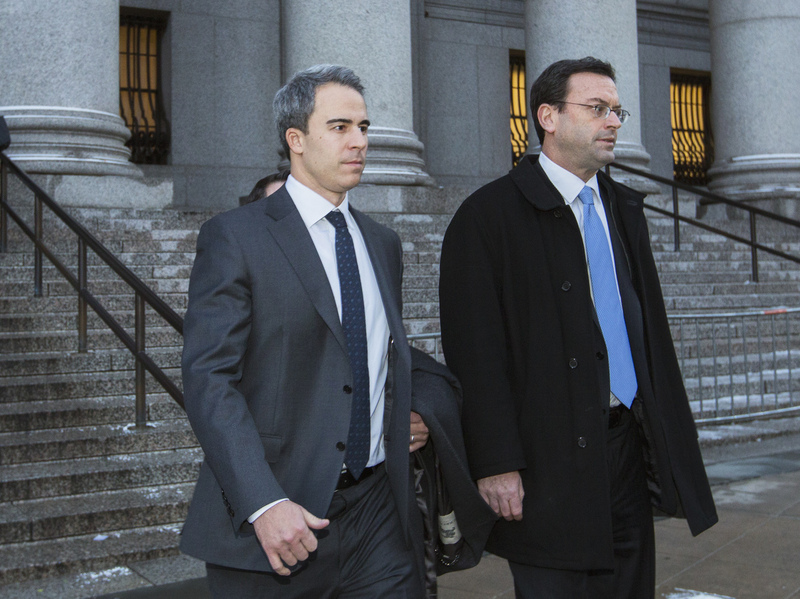 Michael Steinberg (left) departs federal court in Manhattan on Wednesday after being found guilty on charges that he traded on insider information. Michael Steinberg, a top portfolio manager at SAC Capital Advisors, has been found guilty of insider trading — the latest conviction stemming from a years-long federal investigation into the hedge fund's activities. Steinberg was found guilty on five counts of conspiracy and securities fraud. "Prosecutors said he traded on confidential information that was passed to him by an employee, who later admitted to swapping illegal tips with friends at other firms." The New York Times' DealBook says Steinberg is "the highest-ranking employee of SAC Capital Advisors to become ensnared" in the crackdown. Last month, we reported that the Stamford, Conn.-based hedge fund owned by Steven A. Cohen pleaded guilty to wire and securities fraud related to insider trading and agreed to pay at least $1.2 billion in fines. "While an acquittal might have had a chilling effect on the investigation, Mr. Steinberg's conviction instead raised the likelihood that Mr. Cohen, after avoiding criminal charges for years, would face another round of scrutiny. "Agents with the F.B.I. are continuing to investigate allegations that some employees of SAC used inside to information to make trades in shares and options of Weight Watchers, Intermune and Gymboree, according to a person briefed on the matter. "The verdict came as something of a surprise, after Mr. Steinberg's legal team poked holes in testimony from the government's star witness, another former trader at SAC. Prosecutors also privately conceded that the case had flaws, as they relied on circumstantial evidence like emails and trading logs rather than the sort of incriminating wiretaps that underpinned past insider trading trials."